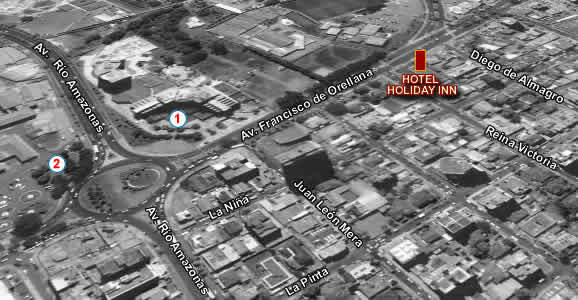 Holiday Inn Express Quito is conveniently located at Avenida Francisco de Orellana, the commercial and financial center of the city. Only 15 minutes from Quito's Mariscal Sucre International. Its modern architecture integrates form and function to a house built in the '50s, considered Heritage of the City. The high quality of its services and facilities make it an ideal hotel for tourist visits to business trips. The Hotel has 137 rooms and 4 suites, comfortably furnished, all rooms have king size beds, coffee maker, mini bar, iron and ironing board, hair dryer and cable 32''LCD. Holiday Inn Express Quito is conveniently located at Avenida Francisco de Orellana, the commercial and financial center of the city. Only 15 minutes from Quito's Mariscal Sucre International.